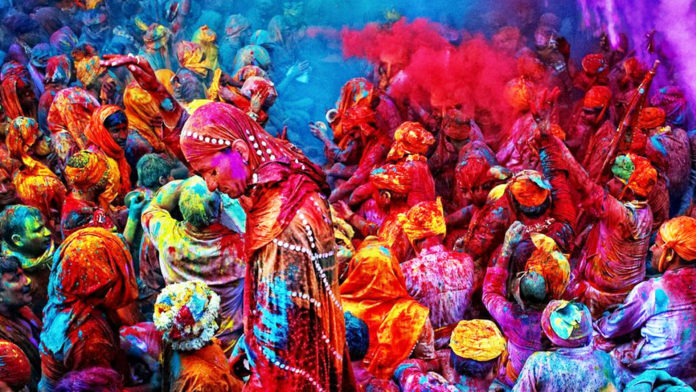 Add a little color to your black and white world at the chromatic and mirthful spring celebration of the Holi Festival Of Colors in India. At this spring festival, you can turn the streets and the crowd of revelers into a canvas of colors by throwing Holi gulal (colored powder) in the air, splashing water guns and water balloons filled with colored solutions, or smearing each other’s faces with colors! The Holi festival celebrates the coming of spring, love, merry-making, and the triumph of good over evil, but depending on the location, its significance differs. In some parts of India and Nepal, it is celebrated to honor the triumph of Vishnu and Prahlada over the evil Hiranyakashipu and Holika. In other parts, it is celebrated to commemorate the coming of spring and Radha’s love for Krishna. The festival is usually celebrated in just two days but some cities and towns, especially those in the northern parts of India, extend it into a week-long celebration. The festival begins with the Holika Dahan where bonfires are lit in the center of the city or town where people would sing and dance into the morning to celebrate Holika’s defeat. The Sorceress. Pushkar, Rajasthan. A woman igniting the ritualistic Holika Dahan bonfire, which symbolizes the destruction of the devil by Lord Vishnu, the victory of Good over Evil. The second day of the festival or the Rangwali Holi is solely dedicated to merriment. Locals and tourists revel in color as they throw around the Holi gulal at each other or at tourists. The Holi gulal or dry powders are traditionally made from flowers, henna, and other plant materials. Although there are commercially available ones, the quality of dry powder made from organic materials are still considered the best. During the festival, you’ll find brightly-dressed women dancing in the middle of the crowd, drenched children laughing around, and tourists donning brightly-painted faces. People of all ages–the younger ones especially–would carry packets of dry powder or tote around water guns and balloons filled with colored solutions as they chased around their friends in an epic color battle. Don’t freak out if your friend or someone else suddenly smears a handful of color on your face though! At Holi, the act of smearing Holi gulal on one’s face is an act of affection as it was in the legend of Krishna and Radha. Want to join the fun? Just buy a packet of Holi gulal from the vendors or get some water balloons to start the fight! You’ll find an arsenal of these colorful powders being sold around the city so you don’t have to worry about losing ammo. This March, say goodbye to winter and welcome back the spring in a kaleidoscopic festival that celebrates love, merriment, and the triumph of good!